Save space, time, and resources with the wireless-capable OfficeJet Pro 9015 All-in-One Inkjet Printer from HP, which packs printing, scanning, copying, and faxing into a single unit. 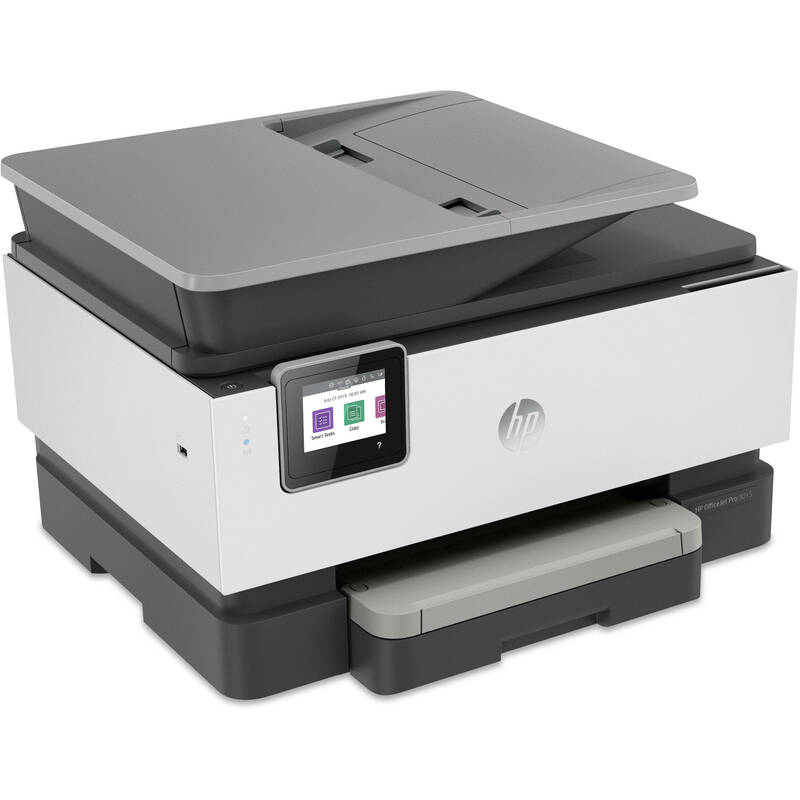 This model has a 250-sheet paper tray for handling large jobs and is eligible for HP's Instant Ink Program, so users will always have a fresh cartridge when needed. At its core, the 9015 is an excellent printer with a print resolution of 4800 x 1200 dpi and ISO print speeds as fast as 22 ppm in black and 18 ppm in color. Borderless printing is available on documents up to 8.5 x 11" and for printing non-borderless documents the printer accepts media up to 8.5 x 14". For copying and scanning the unit has a 1200 dpi CSI scanner, and for multi-page documents the ADF has a 35-sheet capacity. Equipped with built-in Wi-Fi and Ethernet connectivity the 9015 can be added to an existing network with ease, and all of these settings and modes can be intuitively accessed via the 2.65" Color Graphic Display (CGD) touchscreen on the front panel. Wi-Fi Direct features allow users to connect directly from mobile devices for immediate printing needs, while it is compatible with many services for working seamlessly with a variety of devices. For those desiring a direct, simple connection a USB 2.0 port is available. Additionally, the printer is immediately eligible for HP's Instant Ink Program which, for a small monthly fee, allows users to automatically have their printer notify HP when it is running low on ink in order to have a fresh cartridge shipped to your door. This system guarantees that you will always have a cartridge ready to go and keeps you from needing to constantly monitor ink levels. Works with media ranging in size from 3 x 5" to 8.5 x 14"
Box Dimensions (LxWxH) 19.0 x 15.75 x 12.75"
OfficeJet Pro 9015 All-in-One Printer is rated 4.6 out of 5 by 15. Rated 4 out of 5 by GoldenBears from Perfect for Home Office The HP Officejet Pro 9015 replaced an older HP OfficeJet 6700 Series and from initial use and feel its a significant upgrade. Right from taking it out of the box I noticed that the build quality was much better with a thicker plastic shell and an overall sturdiness to the unit that didn`t feel cheap when shaken around a bit. By that I mean the paper feed tray as well as the paper tray just feel more sturdy with the 9015. The 9015 is a much larger unit which is to be expected but still fit in the printer cubby hole I have in my office. The black and gray design to me is much more appealing that the all black I am accustomed to with other HP printers. Out of the box setup was a breeze with the 9015 with just a few pieces of tape to remove and attaching the plug cord. I found the plug cord to be a little on the shorter side so make sure an outlet is close to where you need to put the printer. Once on it was very intuitive to set up the printer on the WiFi and I found inputing the password with the printer`s "keyboard" to be quite easy. The LCD color screen has a very responsive touchpad and is easy to navigate. Once you have the printer on the WiFi you can get the printer setup for mobile printing by downloading the HP app. You should also signup for HPConnected to get all of your HP devices connected under one username and password. Once set up it was time to do some test printing and the 9015 did not disappoint with nice B&W printing as well as color printing. In both modes the printer can do about 20 ppm which suits my needs just fine. I think the best and most distinguishing feature of the printer is it`s scanning capabilities which I found to be much faster than my 6700 and presumably other HP models. Since I have a need to scan double sided some times I found this feature of the printer to be a nice addition versus other printers I have used. The scanner also can save your docs pretty much anywhere or sent anywhere so gone are the days of having to save scans on a usb drive at least for me. So far so good with the HP Officejet Pro 9015 as I am satisfied with what I am seeing, but I am paying close attention to how long the ink cartridges hold up as I found my old 6700 ink cartridges didn`t last nearly as long as I would have liked. Also, I`m not sure if this is the case with the 9015 but I hope I can still print in B&W even if one of the color cartridges goes out. My old 6700 stopped printing when any one of the cartridges ran out of ink even if it was color one and all I wanted to print was B&W. Rated 4 out of 5 by mspeterson84 from Product Review for HP OfficeJet Pro 9015 Printe... This printer has excellent speed capable of handling many small business needs. The printer was very simple to install with minimal components and instructions. The instructions walked though very clearly on the screen attached to the printer. The only somewhat tricky part could be for a novice would be setting up the wi-fi network however if you follow instructions it was very easy. This product is better than other HP printers I have used in the past based on the speed and ease of setup and ability to install to multiple phones and computers. The product does meet my overall expectations and I would recommend this printer to anyone in need of an affordable multi-purpose high speed printer. The only suggestion I would have for HP would be to still simplify further the setup process through wi-fi if it is possible. I overall impression is a solid thumbs up for this printer. Rated 5 out of 5 by kjbxm2j88hpeprintcom from Great printer I love this printer. It prints very quickly, so no long waiting times. Using it with the HP Smart app is amazing. I can print from anywhere in my home and its that easy. The ink it uses is very crisp. Loading the ink into the printer was very easy and it only took about 10 seconds for the ink to be ready. That is the fastest I have seen on any printer to date. I work from home so this is a very big part of my work environment. I like this printer so much that I am selling my old Epson printer. This one is way better. I will never go back to Epson. This printer copies quickly, prints from your phone quickly, and scans as well. All the features on this printer are very easy to use. Also setting up the printer was the easiest I have seen. It literally took me all but about 5 minutes to complete where most printers in the past have taken around 15 minutes. If you want a great industrial style printer but in a compact size that is industrial reliable, get the HP Office jet Pro 9015 printer. You won`t regret it! Rated 4 out of 5 by sephraimmecom from Great product! Although it takes up a lot of space, the HP OfficeJet Printer is very effective at its job. The set up was very easy, although it would not scan the reference page at first. Providing the QR code to scan made it a breeze. The handy dandy app for iOS makers it easy for everyone else to utilize as well in my home office. I like the fact that no network connection or special software is needed to print. The scanner and copying function work decent enough . The definition of the print was good, but not great. Compared to some other wireless printers, the consistency of being able to use the wireless printing function without it losing connection more than made up for it though. Al in all a great product from HP. I would definitely recommend! Rated 5 out of 5 by rsnadickmsncom from Review of HP OfficeJet Pro 9015 MF Printer I have been quite pleased with my new HP OfficeJet Pro printer. Quality:The printer itself is quite sturdy without being too large. The touch screen is responsive and bright, but I would be nice if it was a bit larger. That being said, I mainly use the printer through the HP Smart app, so the touch screen serves its purpose.Setup:I found the setup to be quite easy, including the setting up of wireless printing. Print Quality:The print quality of both documents (black and white and color) and photos is quite good. As a matter of fact my wife thought that the photos I showed her had been professionally done as opposed to being printed on my HP OfficeJetEase of Use:It is just as easy to print wirelessly from either my printer or phone. I have even been able to quickly print large photos wirelessly without the need to make a USB connection.Scanning:Not only is scanning easy to do, but I particularly enjoyed the printer`s ability to scan double sided documents which I find very helpful when scanning larger, double sided documents.If I were to change a couple things about the printer, I would increase the size of the paper tray to fit a full ream of paper. Also, I wish there was a manual feeder option for printing photos and envelopes. Rated 5 out of 5 by TH9252Y188 from New All in One Printer This printer is very stylish looking, stainless steel and black in color. The setup was so unbelievable easy! Just plug in and follow the prompts on the display screen. Does this printer do duplex printing? Duplex copying? Yes, this printer is capable of both duplex printing and scanning.